The average person on the street has no idea what a complicated science Forestry can be. With so much data to try and absorb, it can be a daunting task to figure it all out. Add to that, the misinformation being distributed by extreme preservationists through the media, and you muddy the proverbial waters even more. In this section, we will try and clarify the issue for you with simple harvest data and forest facts. This information all comes from the Oregon State Department of Forestry and the Oregon Forest Resources Institute Forest Fact Book, so you can rest assured of its validity. Below are common questions and answers on frequently asked questions about our forests and logging. Q. How much of Oregon is Forestland and who owns it? About 45% is Forestland. Oregon has about 62 million total acres, about 27.5 million acres of which are Forestland. 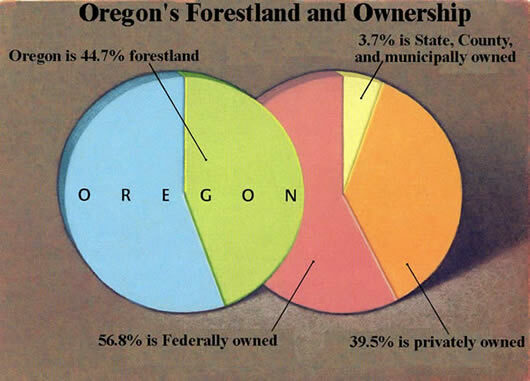 More than half of Oregon's Forestland (60.5%) is publicly owned. The federal government manages 56.8% of Oregon's Forestland, while state and local governments hold 3.7% Of the 39.5% of Forestland that is privately held, 21.5% is owned by large, corporate landowners, and 18% by family forest and tribal owners. SOURCE: Oregon Forest Resources Institute, Forest Fact Book. Q. Is Oregon losing Forestland to other uses? There is nearly the same amount of Forestland today as there was 300 years ago. Of the 30 million acres of Forestland in Oregon in the 1630's, about 2.5 million acres, or about 8%, have been converted to non-forest use* Growth of agriculture, the creation of cities and towns, industrial development, highways, and electric transmission lines have all contributed to the conversion of land that was previously forested. Oregon's forests are carefully monitored by the Oregon Department of Forestry and the agencies responsible for federal forests: the U.S. Forest Service and Bureau of Land Management. Recent improvements in satellite technology have enabled sophisticated mapping systems to track increases and decreases in the amount of Forestland, along with tree growth and other changes in the Forest landscape. * These figures do not include acreage in juniper woodlands, which has increased dramatically over the past century. Q. How much old growth is there in Oregon's forests? Discussion of old growth is often confusing because of varying definitions having to do both with age and structural characteristics. Old growth forests are commonly thought to include: large trees, often with broken tops or signs of decay, a multi-layered canopy with trees of different sizes and ages, and heavy accumulations of wood, including standing dead trees (snags) and large logs on the ground. The age needed to attain old growth status varies among species and sites. For example, a stand of lodgepole pine is considered old at 100 years, while it may take a Douglas-fir forest 200 years or more to develop old growth characteristics. Today many scientists use a more inclusive term, "late successional," to refer to older forests that have some, but not necessarily all, of the features of old growth. In western Oregon, forests with trees greater than about 21 inches in diameter and/or 100 years or more in age are often considered late successional. These forests may provide important wildlife habitat features, such as large trees or snags, needed by species that use mature forests. Approximately 4.9 million acres in Oregon were classified as old growth forest, according to data published by the USDA Forest Service in 1993.This estimate was based largely on National Forest Plans using data classified between 1980 and 1992. Preliminary data from more recent inventories (1993-97) indicate that there are approximately 7.4 million acres of forest greater than 100 years in age, and 1.25 million acres of forests greater than 200 years in age on federal lands in Oregon. In a subsequent study published in 1994 of forests in western Oregon, the USDA Forest Service estimated that there were about 2.14 million acres, 1.47 million (69%) were protected or severely restricted from timber harvest. Other data from recent satellite imagery indicate that there are about 1.4 million acres of forest in western Oregon with an average diameter of greater that 20 inches, and 700,000 acres of forest with an average diameter greater than 30 inches. Of these 2.1 million acres, 1.3 million are protected. Most of the late successional and old growth forest in Oregon is on federal lands. Q. 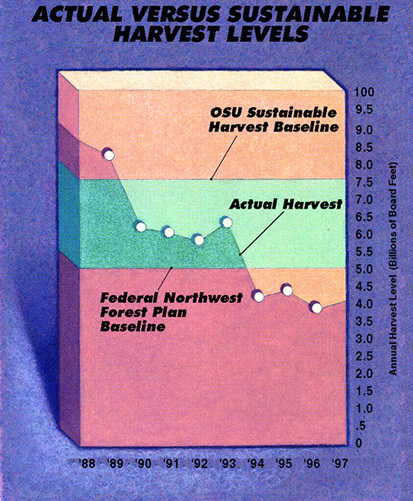 How much of our Forestland is set aside from harvesting? Of the 27.5 million acres of forestland in Oregon, more than 6 million acres are reserved timberland, meaning land that has, for a variety of reasons, been withdrawn from timber production. Reserved timberland includes portions of Oregon's wilderness areas, national parks and monuments, and other reserves and administratively withdrawn areas. In addition, there are 4.9 million acres of "other forestland" that for one reason or another are incapable of producing wood for commercial use because of adverse site conditions. Portions of some wilderness and other reserve areas with adverse site conditions also qualify as "other forestland." Some 16 million acres of timberland remain available for harvest (this is not to imply that all such land is or should be used for timber production). Q. Are we cutting Trees faster than we are growing them? Growth rates exceed harvest rates in Oregon by a wide margin. According to a 1989 Oregon State University study, the long-term sustainable timber harvest in the state is about 7.5 billion board feet per year. Compared to this benchmark, the 1997 harvest was 4.1 billion board feet. In recent years, policy on federal lands has been directed toward creating more late-successional forests by restricting harvests, but as Dr. John Beuter, an expert in forestry and forest economics, puts it, "regardless of what is finally decided on federal lands, Oregon will not run out of timber." Q. What methods do foresters use for harvesting trees? Most people have hear of terms like clearcutting or thinning, but they are only two of an array of harvest methods available to foresters. 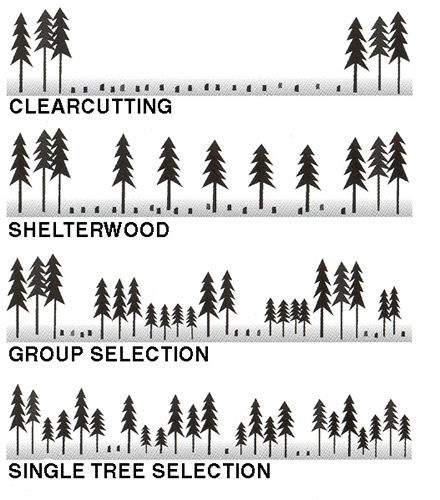 Some harvest methods, such as clearcutting, are used to promote reforestation and remove wood from the site efficiently. Others, like thinning, are used to generate cash flow and improve growing conditions by removing some of the trees, but are not reforestation methods. The choice of method is determined by a complex evaluation of landowner objectives; site characteristics such as terrain, tree species, and regulatory constraints; and effects on fish, wildlife, and other natural resources. And harvests themselves are just a single occurrence in a decades-long series of cultivation and harvesting activities in the life cycle of a managed forest. To greatly simplify, there are two general methods of management and harvest in Oregon known as "Even-aged Management," and "Uneven-aged Management." Uneven-Aged Management -- As the name implies, uneven-aged silviculture involves the cultivation of trees of various ages in a stand and the periodic harvest of selected trees. Uneven-aged stands often contain mixed species as well. Trees are harvested either singly (single tree selection) or in groups (group selection) as they reach maturity. The small gaps created by harvesting leave room for natural seeding or transplanting or nursery-grown seedlings. A common management method east of the Cascades, it is often called Selection or Selected Harvest, Selective Silviculture or Multi-aged Silviculture. It is aesthetically more pleasing than clearcutting, but seems to work better in the more extreme climate of eastern Oregon. Even-Aged Management -- This is the most common method for regenerating Douglas Fir, the dominant species in western Oregon's commercial forests because this species grows best in nearly full sunlight. After harvest, foresters plant Douglas Fir, often mixed with other seedlings, and keep low-lying vegetation from crowding them out for a few years until they are established. Some thinning may take place after 10 to 20 years to stimulate growth, and one or more commercial thinnings often occur between 20 and 40 years. The final harvest completes the cycle and usually occurs between 40 and 80 years when trees are 12" to 30" in diameter. This is called clearcutting because it sets the stage for reforestation and a new cycle to begin. There are variations to this cycle. The most common is Shelterwood, where a portion of trees is left to shelter the regeneration , but is often removed once the new forest is established. Q. Are there laws protecting the forest during harvesting? Oregon was the first state in the nation to adopt a forest practices act, and -- whether a forest products company or a family forest owner -- planning to cut trees is required to comply with its requirements. The Oregon Forest Practices Act (OFPA), adopted in 1971, regulates harvest practices and other forest operations. It also protects forest resources like water, soil, and fish and wildlife habitat. Protecting Water Quality. To protect bodies of water in forests, particularly where fish and domestic water supplies are involved, harvest operations are restricted within a certain distance from the banks. Protecting these streamsides, known as riparian management areas, promotes mature forest conditions, including large trees that provide shade and keep the water cool. They also help maintain fish habitat and prevent sediment from entering the stream. Application of chemicals such as herbicides and fertilizer is prohibited near streams. Reforestation. Reforestation is required after every harvest. Landowners have 12 months to begin reforestation and 24 months to complete replanting. They also must manage competing vegetation until the young trees are free to grow. Regulations require trees to reach this point within six years. Leaving Trees and Downed Logs for Wildlife. A Landowner must leave at least two green trees or snags plus two downed logs per acre in any harvest unit larger than 25 acres. Wildlife biologist have learned that snags and downed logs, as they decay, provide nesting sites and other habitat for many birds and other animals. Green trees are a future source of snags and add to forest complexity. Size Limits. Clearcuts are limited to 120 acres within a single ownership, with certain permitted exceptions. In addition, they cannot take place within 300 feet of another clearcut on the same ownership until the clearcut area is successfully reforested. Roads. There are strict regulations governing the construction and maintenance of forest roads on public and private land. They must avoid marshes, meadows, drainage channels, riparian areas, and, when possible, steep terrain. Where a road has to cross a stream, culverts and bridges must allow fish passage. The road, adjacent ditches, and culverts have to be designed and maintained to minimize erosion and runoff that might enter streams. Sensitive Wildlife Habitat. Harvest operations must be avoided or modified in compliance with Department of Forestry regulations in areas near sensitive bird nesting, roosting, or watering sites, particularly when used by osprey, great blue herons, bald eagles, or northern spotted owls. Operations Plans Required. All harvesting operations require prior notification and site maps for Department of Forestry review. Harvesting and road construction near streams and high-risk sites, such as steep slopes, require written plans or prior approval. Q. What's being done to protect wildlife in Oregon's forests? About 300 species of native vertebrates in Oregon use some form of forest cover. Because disturbances, both natural and human, over time have produced a mosaic of forests of different ages, forest habitat is not uniform. Scientists are learning that this mosaic is actually beneficial to wildlife because different animals have different habitat needs. What is emerging is a picture of a wildlife community associated with diverse forest habitats needed for feeding, breeding and shelter. Many species -- like elk, lazuli buntings, and goldfinches -- use open areas such as clearcuts. Some, like the northern spotted owl and marbled murrelet, need the structures and stand conditions provided by older forests. Still others do well in most forest stages, young and old. Changes in forests often benefit one species to the detriment of another. Scientists have learned that the age of a forest stand is less important than its habitat structures. The realization that forest management practices can actually create or leave desired habitat structures with the potential to benefit wildlife diversity led to Forest Practice Act requirements to leave snags, downed logs, and wildlife trees after a harvest. It also has given rise to use of a variety of new forestry techniques to create habitat diversity in managed forests. Q. What percentage of Forestland is harvested each year? Some form of thinning or harvesting took place on approximately 678,000 acres of private industrial and family-owned forestland in 1997, the most recent year for which data are available. This acreage represents about 2.5 percent of Oregon's 27.5 million acres of forestland. About 96,000 acres (less than one-half of one percent of Oregon's forestland) were harvested by clearcutting. Partial cutting occurred on the other 582,000 acres on which harvesting took place. 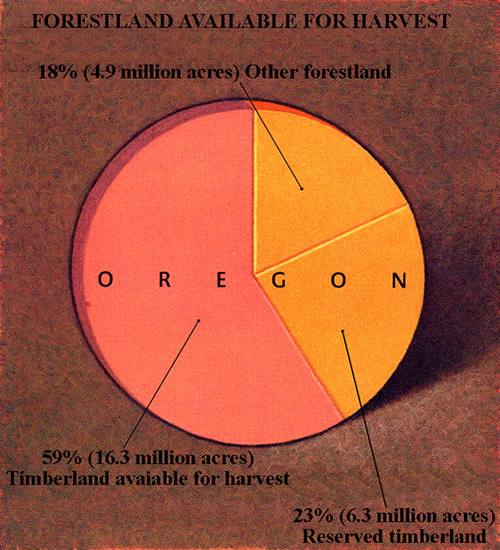 Of the 15.6 million acres of federal forestland in Oregon, 99,433 acres (about 6/10ths of 1%) experienced some form of harvesting in 1997; 7,088 acres (about 1/20th of 1%) were clearcut. Q. How many acres are reforested each year? Virtually all land in Oregon that is harvested through clearcutting is reforested. Oregon's reforestation requirements, which are spelled out in the Oregon Forest Practices Act, are among the strictest in the nation. Forestlands must be replanted within two planting seasons after harvest, and within six years the site must be certified as "Free to grow," meaning the young trees are higher than any competing ground cover. Until that time, the landowner is responsible for seeing that the new seedlings are not over-taken by other groundcover. These requirements also apply to forestlands where partial cutting has reduced tree density below certain limits. Nearly 47 million seedlings were planted on 158,000 acres of Oregon forestland in 1997. Q. How does forest harvesting affect water quality? Because forests grow in high rainfall areas, most streams originate in or pass through forestland, especially west of the Cascades. Clean water is critical to our quality of life, and because in the West so much of our useable water passes through forests, discussions about water supplies and quality invariably touch on forest management practices. 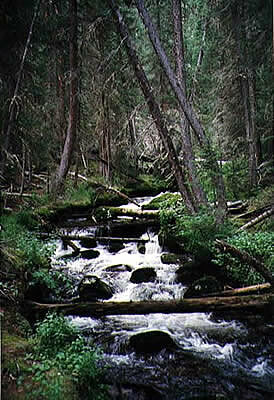 In general, forests have beneficial effects on water quality. Forest soils are very porous and most precipitation that falls on a forest infiltrates rather than flows across the surface, which can cause erosion. Forest soils are also an effective filter, removing organic and inorganic chemicals from precipitation. The closer streams are to the forest, the clearer they generally are, which is why so many municipal reservoirs are located in forests. Erosion is a significant threat to water quality, and any disturbance that causes erosion, including forestry activities, has come under scrutiny. Forest roads are a potential source of sediment from erosion, especially during major storms. Most research has focused on older forest roads built in the 60's and 70's, but considerably less erosion has been reported from newer roads built to meet current Forest Practices Act design standards. Harvesting to the edge of streams can also lead to erosion as well as increased stream temperatures. However, Forest Practices Act rules adopted in 1987 require specific buffer widths along fish-bearing and other streams, mandating retention of a minimum number of conifers within buffers. These rules were strengthened in 1994 to increase conifer retention requirements with the objective of creating mature forest conditions along streams and improving fish habitat. Chemical contamination fore forestry operations is another potential concern, especially in regard to drinking water. Forest Practices Act rules are designed to prevent chemical contamination of streams, and monitoring has shown them to be effective. Q. Does timber harvesting cause landslides? Landslides are a relatively common, naturally occurring hazard in some parts of Oregon. Landslides in Oregon are typically "triggered" by periods of heavy rainfall and/or rapid snowmelt. Certain geologic formations and locations with very steep slopes are most susceptible to landslides. Although landslides are a natural geologic process, their incidence can be accelerated by human activities, including forest practices. A recent study by the Oregon Department of Forestry confirmed that landslides occur in forests of all ages, whether or not they have been harvested. This study, the largest ground-based investigation ever conducted of landslides, found that timber harvesting on very steep slopes will likely increase landslide occurrence for a period of roughly 10 years. In addition, forests between 10 and 100 years of age typically had lower landslide densities and erosion than found in mature forest stands, a finding new to this study. Landslide occurrence on less steep slopes (typical of most forestland) was low. Roads associated with forestry activities and other land uses have been a significant source of landslides in steep terrain. Roads built under newer Forest Practices Act rules have resulted in smaller and fewer slides than roads built to older standards. Landslides have historically contributed to fish habitat by providing sediment, logs, and other material to streams. Forest practices may change the size and composition of what a slide deposits in a stream. This is why the Oregon Plan For Salmon and Watersheds encourages placement of logs and other habitat features in streams and strategic locations for fish. The Oregon Legislature recently granted authority to the State Forester to regulate harvesting where there is a significant risk of a rapidly moving landslide. *Nearly four-fifths of the landslides that entered streams during the 1996 storms occurred on slopes of greater than 70 percent, and none entered streams from slopes under 40 percent. Q. How do forest products contribute to Oregon's economy? There was a time when forest products was Oregon's economic leader, but urban growth in the last couple decades has been accompanied by a thriving high-technology industry that has now surpassed forestry in terms of employment. During the last two decades employment in the wood products industry has declined by about one-third, from about 90,000 to about 61,000 in 1997. (High-tech jobs stood at about 70,000 in 1997). However, Oregon still leads the nation in timber production. The wood products industry still accounts for about 27 percent of the jobs and income in Oregon's manufacturing sector, but according to forest economist John Beuter, even that figure underestimates its importance to Oregon's economy. 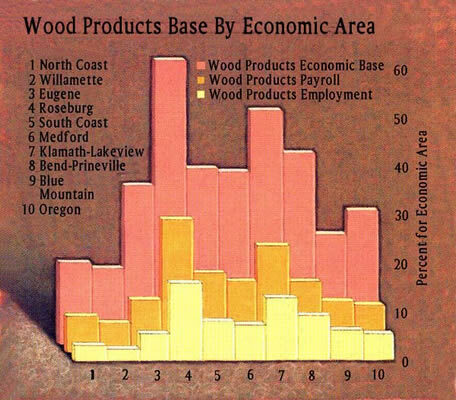 Wood products is considered a "basic industry" because most forest product sales are outside Oregon. The income that wood products brings into Oregon spreads through local economies to businesses that provide goods and services to basic industry sectors, and those employees in turn support many service and retail jobs. There is also an interesting geographical component to Oregon's economic base. The high-tech industry is growing quickly in the Willamette Valley's metropolitan areas, especially around Portland, but is a relatively small part of the economic base of the rest of the state, which remains dominated by wood products and agriculture. Wood products, for example, accounts for about five-percent of Portland's economic base, but for all of Oregon excluding Portland, it stands at about one-third of the economic base. Q. What wood products are manufactured in Oregon, and where do they go? Lumber: Oregon leads the nation in softwood lumber production by a wide margin. 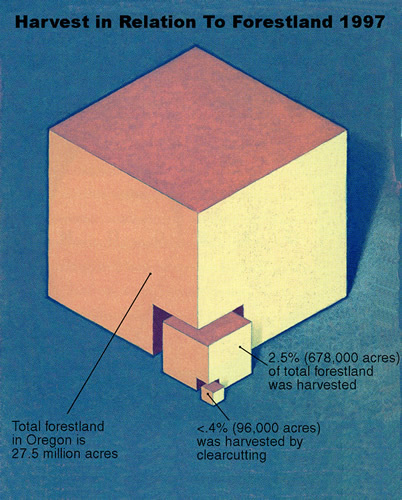 In 2001, Oregon sawmills manufactured 6.06 billion board feet of lumber, or 18% of all lumber produced in the U.S. Panels & Engineered Wood Products: These special wood products made in the state include plywood, particleboard, oriented strand board, laminated beams, I-joists, and laminated veneer lumber. Millwork: Oregon-made products in this category include doors, window frames, moldings, fencing, staircases, paneling, veneer, strand board, and fibreboard. Pulp & Paper Products: Oregon manufactures tissue, newsprint, fine coated & uncoated printing papers, photocopy paper, cartons, paperboard, cardboard, food containers & packaging materials, paper pulp, and wood residues used to make resins, glues, cosmetics and certain plastics. Household Products: These Oregon-made products include furniture, shelving, partitions, playground equipment, wood toys, cabinets, pencil stock, landscape bark and compost. FACT: In addition to the myriad of building materials made of wood, more than 5,000 common products, from paper and packaging materials to life-saving medications, are derived from trees.